More populous than the capital and La Paz, and one of the fastest-growing cities in the world, Santa Cruz has become a thriving commercial center, yet retained some of the trappings of tradition. Take a break from Santa Cruz with a short trip to El Fuerte de Samaipata in Samaipata, about 1h 50 min away. 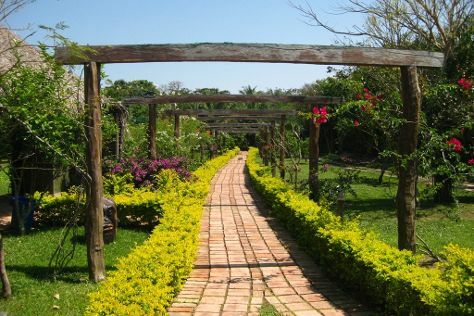 Spend the 28th (Sun) exploring nature at Noel Kempff Mercado National Park. Spend the 1st (Wed) exploring nature at Kaa-Iya National Park. There's lots more to do: take in nature's colorful creations at Guembe, contemplate in the serene atmosphere at Catedral de Santa Cruz, make a trip to Plaza 24 de Septiembre, and take in the architecture and atmosphere at Parroquia de la Inmaculada Concepcion. For where to stay, more things to do, and more tourist information, go to the Santa Cruz holiday planner. If you are flying in from Brazil, the closest major airport is Viru Viru International Airport. April in Santa Cruz sees daily highs of 33°C and lows of 24°C at night. Finish up your sightseeing early on the 1st (Wed) so you can travel back home.